Home » Tutorial » Wine bottle shapes: why are they so different? Have you ever noticed that wine bottles have different shapes? Why? Every type of wine has its own bottle. We have already looked at the different sizes of wine bottles. Now, our attention is on the shape! In this article, I want to analyze the different wine bottle shapes, starting with their origins and going up to the glass colors. As you already know, the standard capacity of a wine bottle is 0,75 L. Now, it’s time to analyze the different parts of the bottle to understand better the wine bottle shapes. It’s also called “crown”. In past, it was used for anchoring the cork to the bottle with strings or for a better grip of the sealing wax. It’s the narrowest part of the bottle, where the opening for pouring is. It’s the link between neck and body. The shoulder is important for pouring and settling. It’s the biggest part of the bottle, where the wine goes. It allows the bottle to keep a vertical position. There is also a punt, more or less hollowed out. It’s the most common shape and, as the name indicates, it’s originally from Bordeaux. It has straight sides and distinct shoulders. Usually, the color of the bottle is dark green or brown for red wines and light green or transparent for white wines. Ok, why the difference in colors? Because the colored glass protects red wines from the rays of the sun, and a transparent bottle improves the yellow color of white wines. This bottle is used for a lot of grapes, such as Cabernet Sauvignon, Merlot, Malbec, Sauvignon Blanc, Chenin Blanc, Semillon and Sauternes. It’s the revisiting of the Bordeaux bottle, but it has higher shoulders. It looks also more elegant. The other characteristics are the same as the previous wine bottle. It was introduced before the Bordeaux bottle (around the 19th century) in Burgundy. This bottle has sloping shoulders. Usually, the color of the glass is green. Some examples of grapes for which this bottle is used are Pinot Noir, Chardonnay, Syrah, Nebbiolo and Pinot Gris. This bottle is typical for Langhe, Piedmont. It originated in the beginning of the 18th century. It looks similar to the Burgundy bottle. The Albeisa bottle is used for the great red wines of Piedmont. The shape is a mix between an amphora vessel and a bowling pin. It’s the typical bottle for the wines of Côtes de Provence. In Italy, it’s used for Verdicchio wine. The glass for this type of bottle is typically transparent (light green for Verdicchio). It’s taller and thinner in shape compared to the other bottles, with gently sloping shoulders. The color is green for German wines and brown for French. The main grape contained in this type of bottle is Riesling, both dry and sweet. It’s a peculiar bottle because it must resist the high pressure of the sparkling wines (6 atm or 90 psi). It’s also heavier and thicker, with a hollow bottom. The shape looks similar to the Burgundy bottle. The color is usually green, from light to dark. This bottle has the same characteristics as the Champagne bottle but the shape is slightly different. The body at the bottom is larger and the neck is longer. It’s a smaller Bordeaux High Shoulder. The capacity is 0,375 L or 0,5 L. The color is dark green and it’s mainly used for dessert wines. It’s used for Hungarian Tokaji and it has a capacity of 0,5 L. The glass has a transparent color. It’s the typical bottle for Port, Madeira and Sherry wines. The bottle has a bulb in the neck, which is intended to trap excess sediment during the pouring. The color of the glass can be green (with different shades) and also brown. It looks similar to the Port bottle, but it is higher and thinner. It’s used for Marsala wine and the color of the glass is typically dark brown or black. This bottle is short, stocky and heavily built. It’s the only one legally authorized for Vin Jaune. Its capacity is 0,62 L.
It’s completely different from the other wine bottle shapes; it is a flattened ellipsoid. The glass has a dark green color. It’s used for the red wines of Franconia region, some Portuguese wines, and any Orvieto wines. This particular shape is protected under the European Union. 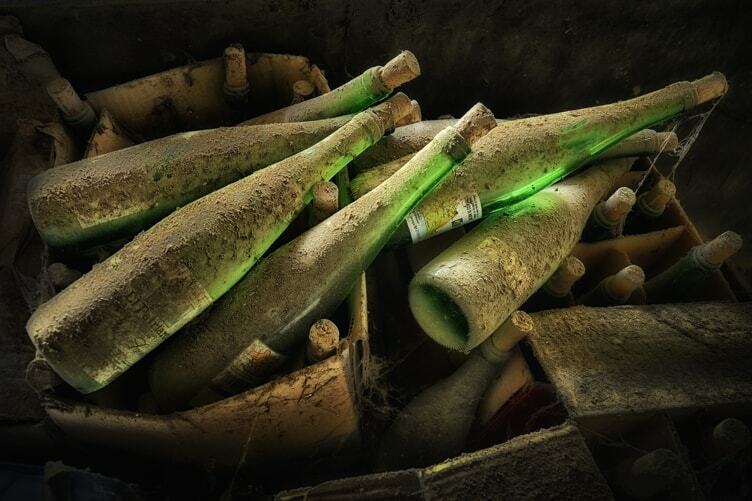 This is the old bottle of Chianti wine which is no longer used. The bottle gives a rustic aspect to the wine. The bottom is round, so it requires a basket to allow it to stand upright on the table. The capacity is around of 2 L.
You can download the PDF file with all the wine bottle shapes. Please click one of the bottoms below! I haven’t forgotten. We have finally arrived at the desired question: why are they so different? It’s the simplest answer. Each bottle comes from a different region, with its own specific techniques of glassblowing. You can put a Riesling in a Bordeaux bottle and the wine will not change. The sparkling wines are the only exception, you need the appropriate bottle because of the high pressure. 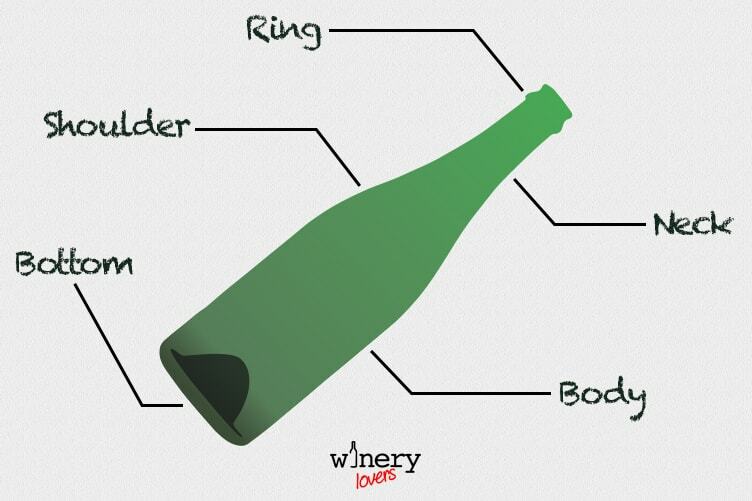 Have you ever seen personally all the different wine bottle shapes that we mentioned here? What’s your favorite bottle shape? Let me know by leaving a comment.